Wubet, 48, is a primary kala azar patient with HIV co-infection. 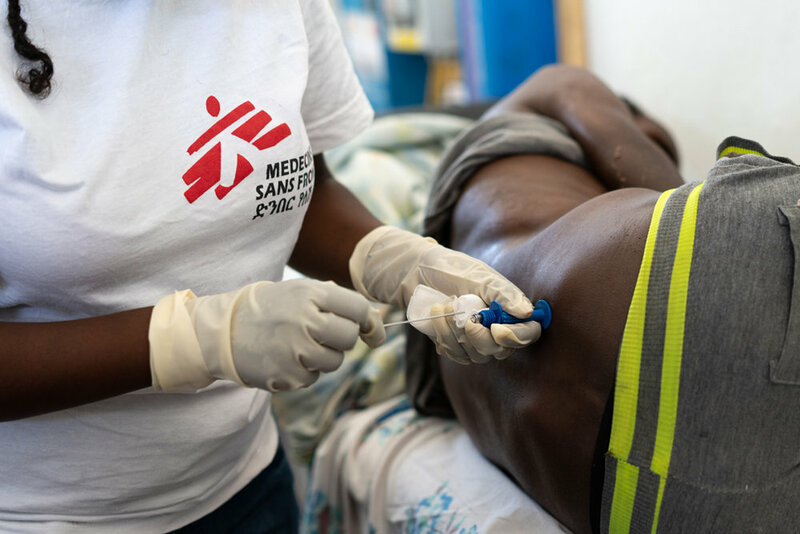 He is being treated by MSF in Abdurafi, Ethiopia and is part of the kala azar research programme led by MSF and Antwerp Institute of Tropical Medicine (ITM). Kasaye sits on his bed in the intensive care unit of the MSF health centre in Abdurafi, a bottle of soda and some cookies in his hands. He looks incredibly frail and the simple acts of drinking and eating seem to require immense effort. 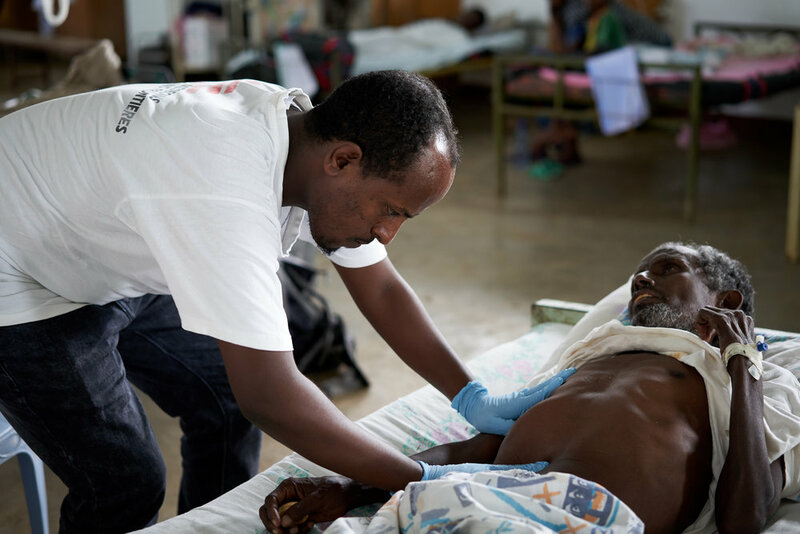 “This is the thirteenth time that I have come to MSF for kala azar treatment,” he says. Kala azar (also known as visceral leishmaniasis) is the second largest parasitic killer after malaria, which makes it one of the most dangerous neglected tropical diseases in the world. Every year, it infects between 200,000 and 400,000 people mostly in Asia, East Africa and South America, and around 50,000 die because of it. Kasaye, 55, is a secondary kala azar patient with HIV co-infection. Over the past 16 years, he has had 13 recurrences of the disease, all of which have been treated by MSF first in Humera and then in Abdurafi. Usually, once treated, patients become immune to the parasite. However, this was not the case for Kasaye who, one year later, was diagnosed with HIV. HIV can prevent patients from being fully cured of kala azar, exposing them to the risk of relapse. To make things more complicated, kala azar and HIV co-infection is disastrous because both conditions weaken the immune system and reinforce each other. This leaves a person vulnerable to other opportunistic diseases like tuberculosis, malaria and dysentery. Ethiopia has a very high number of co-infected patients, with 20 to 40 percent of kala azar cases occurring in people living with HIV. Economic status seems to be a determining factor when it comes to kala azar relapse in HIV co-infected patients, as people in poor living conditions are more exposed to sandflies – the carrier of the parasite - and are further debilitated by the lack of food. Dr. Ernest Nshimiyimana, MSF medical team leader, visits kala azar patients in the kala azar ward of the Abdurafi health centre. Diagnosing kala azar is complicated. Rapid diagnostic tests are the tool available in most health facilities, but they are reliable only with patients infected by kala azar for the first time (a condition called primary kala azar). The importance of this lab is significant. Mortality rates are up to 14 times higher in HIV co-infected and relapse patients. Therefore, a timely diagnosis is instrumental in saving lives. The lab is also used to study the prevalence and incidence of kala azar in HIV patients in partnership with the Institute of Tropical Medicine Antwerp (ITM), the University of Gondar and the Ethiopian Regional Health Bureau in Amhara. Research began in October 2017 and will run for four years. Aderaju Kibret is MSF’s medical research manager and is responsible for the recruitment of patients for this study, as well as for the monitoring of their condition. “We are especially looking for people living with HV who develop kala azar even if they are on antiretroviral therapy. Here in Ethiopia we have quite a few cases”, says Aderaju. “We monitor patients for a minimum of three months and for up to two years. The aim of the study is improving our understanding of the disease and developing better prevention methods”. Only a few institutes or pharmaceutical companies are investing time and money into kala azar research, with the consequence that very few new drug treatments are being developed. Kala azar primarily affects people who cannot afford to pay for the drugs, thus representing an unattractive market for drug companies. Kasaye is one of the currently 325 patients enrolled in the study.